In addition to accepting ACH payments through Stripe, NowRenting also enables you to accept payment by credit card. Note that you must enable ACH and credit card payments for each individual lease, as well as for your account in general. To do so, you must already have a Stripe account connected to NowRenting. See here for instructions. 1. First, navigate to nowrenting.com/settings/rent-collection by clicking Rent Collection in the dropdown menu in the upper right. 2. Make sure the checkbox labelled Credit Card is checked, and press the Save Changes button. 3. When you create a new lease, as described here, you will be given the option of turning ACH payments and credit card payments on or off. You must make this decision for each Lease individually. This is also where you can decide whether your tenants will pay the additional fee required for Stripe processing, or whether you’ll bear it. Your tenants will now be able to pay their rent via credit card. 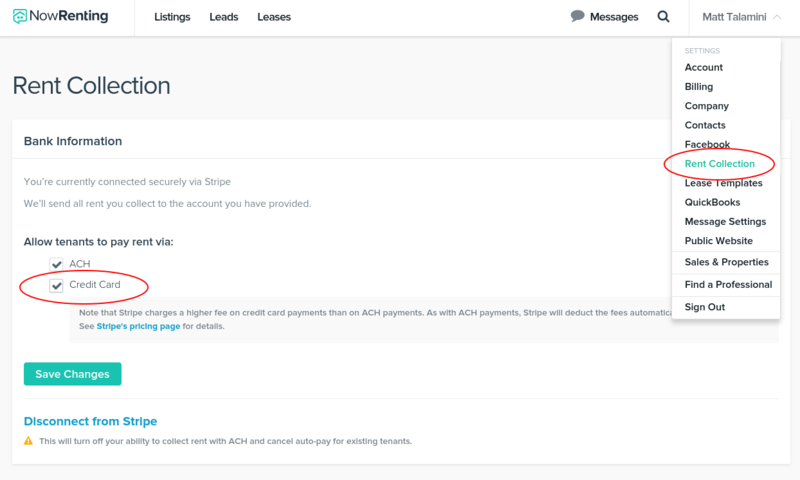 Note: Stripe charges different fees for credit card payments than for ACH. 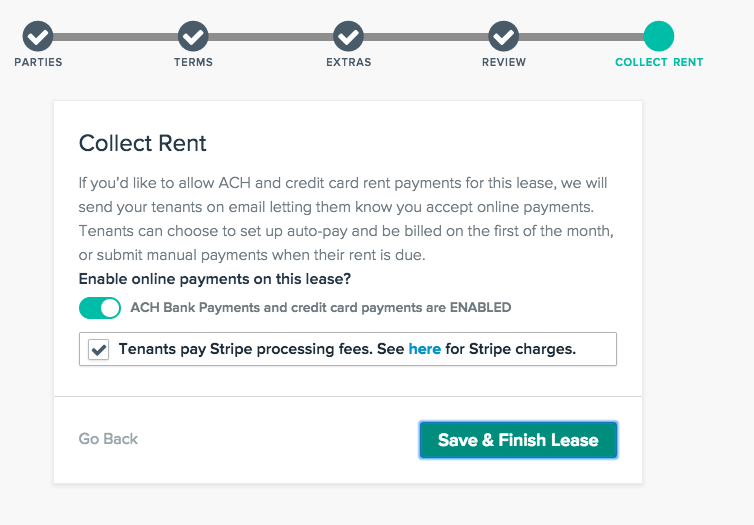 Stripe will deduct the fees automatically for each payment unless you choose for your tenant to pay the fee. For details on Stripe’s pricing policy, see here.